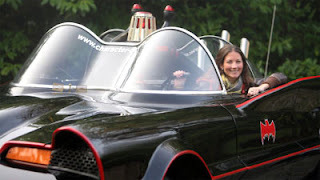 If you're at a loose end for that perfect Christmas gift, you can now buy your very own Batmobile. It'll set you back about 192K, but there's some good news--delivery is free. If you're a real reformer, you can use it to clean up all the jokers at Tweed. Or you could chase down corporate criminals, doubtless impressing them with the fact your car is just as expensive as theirs is. It's my understanding every member of the Cathie Black selection panel received one as a gesture of good faith from Mayor Bloomberg. Full disclosure--panel members are not constrained by the five-dollar limit Chancellor Klein imposed on gifts for city teachers. Note: An astute reader points out, for bargain hunters, you can buy one here for a trifling 150K.